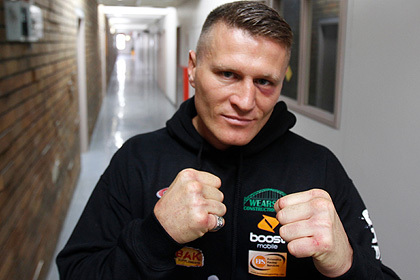 The storied boxing career of Danny Green again seems to hang in the balance after he was beaten by TKO by Poland's "El Diablo" Krzysztof Wlodarczyk in the 11th round of their WBC cruiserweight title bout at Perth's Challenge Stadium tonight. Green started by far the sharper of the two fighters and was ahead comfortably on every judge's scorecard at the time he was floored by a Wlodarczyk left. 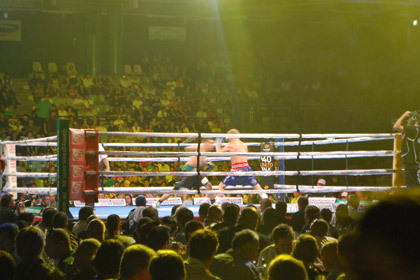 By contrast, the Polish visitor had started sluggishly and Perth heavyweight Mark de Mori, guest commentating for WAtoday.com.au noted that the titleholder was looking like a zombie. The zombie awoke, however, in time to end Green's night - and, at 38, perhaps his career. Green said in the ring after the fight that he did not know what the future held, although he was much happier with his performance tonight than he was against Antonio Tarver in Sydney in July. "I took on the best cruiserweight in the world tonight and was four minutes away from a fairytale," Green said. "I've come back from having my arse handed to me by Tarver, when I was just awful." Wlodarczyk admitted he had started slowly but felt he warmed to the task, something no-one in last night's crowd would have disputed. "I think I felt less pressure on me boxing away from home," Wlodarczyk said. There was some interesting by-play in the crowd, with an enthusiastic and vocal group of Polish fans countering the expected army of "Green Machine" fans. While the Poles roared loudly for their hero as he put his WBC belt back on at the end of the fight, they also had the good grace to chant "Danny Green" in honour of the Perth fighter. Green was highly gracious in defeat, congratulating Wlodarczyk on his 46th win in his 49th fight. Green's now has five wins from his 36 professional fights and, with one retirement already under his belt, there will be speculation over whether this is the end for the three-time world champion. Scroll below to relive the fight, round-by-round. 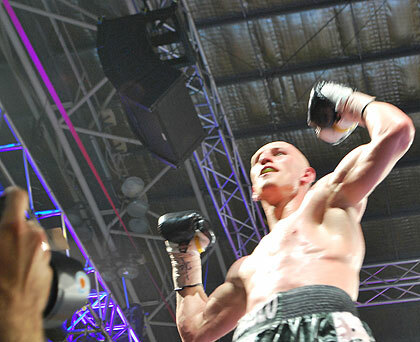 The sight Danny Green never wanted to see - Krzysztof "El Diablo" Wlodarczyk celebrating his win at Challenge Stadium. 8.33pm - Fair to say the mood in the room - other than the Polish fans - is muted. Think everyone thought Green was going to hold on and win on points, then down he goes and it's all over. He was leading 97-93 on two of the judge's scorecards before he got floored and 96-93 on the other. That Wlodarczyk is one tough hombre. 8.32pm - Polish crowd going absolutely nuts for their champ. Danny Green, as always, very gracious in defeat. Says he had his "arse" handed to him by Tarver in July and has now gone within four minutes of beating the world's best cruiserweight. 8.28pm - Mark de Mori says he can't believe the size of Wlodarczyk's comeback. Reckons Green should fight on as it would be a shame for his great career to end like this. But Green's speech in the ring then just sounded a lot like a retirement speech. Wlodarczyk says he felt less pressure fighting away from home. 8.18pm - Oh dear, did I really just write that? Wlodarczyk just dropped Green and it's goodnight nurse. The Pole keeps his title, Danny has a headache and, at 38, there are bound to be questions over his future. It was a massive left that Wlodarczyk unleashed to do the damage. 8.17pm - Round 10 now and Green's had his nose busted a bit. But, as our guest expert Mark De Mori notes, he's got the better tan, the better hairdo, the better skills and he's miles ahead on points. Just has to stay on his feet to win. 8.10pm - Round nine and Green just landed a beautiful left jab. Great call by @White_Adam on Twitter who points out that Krzysztof Wlodarczyk would make a hell of a score on Scrabble. Kind of reminds me of the old Dennis Cometti quote about Melbourne footballer Adem Yze - the great man called him a "terrific young player but a bad Scrabble hand." 8.07pm - Whoa, has Wlodarczyk finally woken up. The Pole looked much better that round and Mark De Mori says that was the visitor's best effort since the second round. 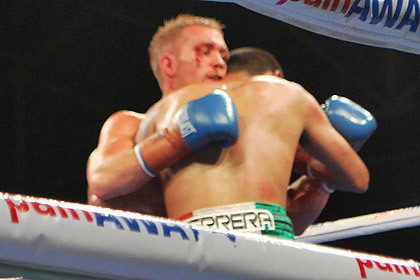 The De Mori scorecard has Green ahead 70-62 after seven rounds. Five more to go - does Wlodarczyk keep his belt or does Danny Green become a world champ again at age 38. 8.00pm - De Mori's given the sixth round to Green as well - 10-9. Reckons he's making Wlodarczyk look very average with his speed and jab. Says it should also be noted that Green has a far better tan! Good call. 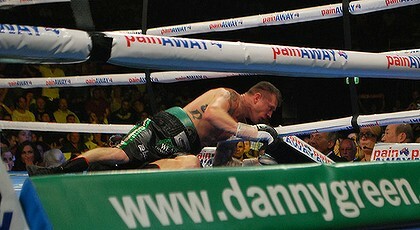 Danny's biggest problem seems to be keeping his mouthguard in...it's hit the canvas twice now! 7.57pm - "Go back to Poland" is the chant from some of the Green supporters. The Polish fans are yelling something back. Is it "take us to Poland"? Not sure, but it's all very entertaining...and fair-spirited...for now. 7.54pm - Pro-Green portion of the crowd is going positively nuts here at Challenge Stadium. Danny Green absolutely dominated the fifth round, landing shots to every part of Wlodarczyk's body. De Mori scores that one 10-8 to Green, although, to the Wlodarczyk's credit, he didn't appear all that shaken up by the onslaught. 7.52pm - The Polish crowd is chanting what appears to be "there's only one Krzysztof Wlodarczyk". On behalf of all the journos who have had to type his name, I certainly hope so! Maybe they are trying to wake their man up, he's looked positively sleepy through the first four rounds - all of which our guest judge, Perth heavyweight Mark de Mori has given to Perth's hero Green. 7.50pm - Green looks an entirely different fighter than he did in July. Sounds like his trainer Angelo Hyder was right when he said The Green Machine was in the right headspace. Another 10-9 scoreline in the third round according to our man Mark de Mori. 7.45pm - De Mori also gives round two to Green, again 10-9, liked his jabs and combos. Reckons Wlodarczyk is waking up with some power punches but Green has the speed and agility to take him. 7.40pm - Danny Green has started a lot more confidently than he did in July against Antonio Tarver. Our guest commentator, Perth heavyweight Mark de Mori, gives him the first round 10-9. Likes the way he looked relaxed and thought Wlodardczyk looked tight. 7.32pm - And Danny Green is out in the ring. Crowd loving the Down Under over the speaker and roaring for the home town hero. Wlodardczyk coming out now and there's a fair Polish contingent here as well. "Diablo, Diablo" they chant. Belter of an atmosphere. The visitor has a bit of hip hop for his soundtrack, don't mind the sound of it actually. 7.30pm - Holy smokes. Wlodarczyk in to $1.54. Green out to $2.30. That's some money being thrown around. 7.25pm - got our first update here from Perth heavyweight Mark de Mori, who is providing us with some expert commentary. His prediction is that Wlodarczyk might just prove too strong on points but he's hoping he is wrong. Stay tuned for Mark's scorecard at the end of each round. 7.20pm - observation from sitting semi-ringside. Either you see more celebrities when you watch a fight on TV, it's too dark to see any in here or we just don't have any famous folks in Perth. Possibly I could be typing too much and The Queen (an avid fight fan, I hear) just walked past and I didn't see her. 7.15pm - the view from our media seats. Can't wait for the big one to start, hopefully in 20 minutes or so. 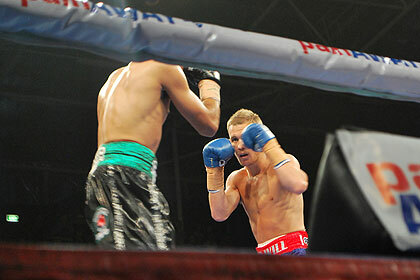 Long-range action from Will Tomlinson's win over Alan Herrera. 7.10pm - 25-year-old Aussie Will Tomlinson has unanimously won his first world title - thanks Danny Green for the opportunity to fight on the undercard and says he can't explain how good it feels. Also thanks his cut man for looking after the damage next to his eye. Respectfully calls out Michael Katsidis and says he wants to fight him in Melbourne. Finishes off with the Jeff Fenech classic of "I love youse all". It's a popular win. 7.04pm - Geez Louise...some fair haymakers thrown there in the last round. Both blokes were in danger of suffering windburn. Both have also thrown their arms up to celebrate victory. I guess we'll just await the judge's verdict. 6.55pm - the crowd is just loving Will Tomlinson's work. "Will, Will, Will" has become the enthusiastic chant. As the pic below shows, he's worn a couple but he's giving as good as he gets. We're up to Round 12 and scores must be close. Will Tomlinson, fighting like a warrior. 6.44pm - this is a cracker of an undercard fight. The Aussie Tomlinson (he's even got the "oi, oi, oi" chant a couple of times) has claret all over his face but keeps coming at his Mexican opponent. Great stuff. 6.34pm - an hour before the big fight and the money with the WA TAB has all been for Wlodarczyk. The Polish fighter is in to $1.65 after being as much as $1.90 earlier today. Green has drifted from $1.80 to $2.15. Looks good value at that price but, as they say, money talks. 6.29pm - Will Tomlinson lands a very nice right to end round three. Reckon he might have the gained ascendancy over Herrera at the moment, although the Mexican still looks a dangerous opponent. Australia's Will Tomlinson (right) taking on Mexico's Alan Herrera. 6.23pm - some nice action here in the WBA superfeatherweight title fight between Australia's Will Tomlinson and Mexico's Alan Herrera. We'll get you a couple of pictures of the boys in just a minute. Herrera might just be in front going into round three. The TV cameraman on the right seems to be enjoying his work for some reason. 6.05pm - from heavyweights to featherweights. Daud Yordan from Indonesia scores a stoppage win against Franky Archuleta from the USA. 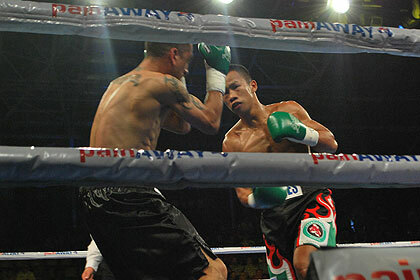 Daud Yordan (right) takes it to Franky Archuleta. 5.50pm - still about an hour and 40 minutes before Danny Green and Krzysztof Wlodarczyk square off. Just spotted a couple of girls dancing on tables before between rounds. Either they are really enjoying the undercard or they are part of the entertainment. 5.45pm - fitting that last undercard fight was a heavyweight bout as we've got Perth heavyweight boxer Mark de Mori helping us out with some expert commentary tonight. Mark, who is signed with American promoter Don King and has won 16 of his 19 professional fights (14 by KO) is going to provide us with his own scorecard for the Danny Green fight. 5.40pm - bit of entertainment already in the undercard. Anthony "The Bull" McCracken beats Shane "Killer" Tilyard in the fourth round. Ref stopped the fight after McCracken had Tilyard on the ropes administering some punishment. 5.30pm - G'day guys, WAtoday.com.au's sports reporter Simon White signing in. Welcome to Challenge Stadium for tonight's big fight between Danny Green and Krzysztof Wlodarczyk. By the end of the night I'm hoping to be able to spell the Polish visitor's name without going for the copy and paste option! Maybe Greeny will have another world title as well. Nice crowd building already here.